Hi akquilter, welcome to the forum! Thanks for the information, ElectronX. I will quit obsessing over every aspect of this game! As a newbie to forums, I will also figure out how to answer a post without creating a new message. Hey folks. My friend is running on Android, somehow got logged out. She obviously does not have Game Center. How do we get her logged back in? I'm assuming she's logged out since the game reverted to the beginning. Thanks for any help! Lvl 27- silver oly, turbo baby gold, 2 peridot and one egg, two sapphire, sun dragon, two blue moons, equinox, silver. Goal list: more olys, PANLONG!!! 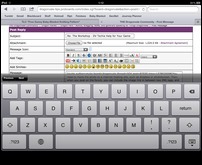 In the lower right hand section of the screen you will see the Options button. Press that and at the bottom of the list is a Login button with a facebook icon. Hit that and it will ask you if you want to use your local park or your Facebook park. Choose Facebook and it should reload her park. Are we talking in game options button? There is no login screen there. Circled in red is the options button as it appears on my Android device. And here's the options screen itself. The button I have circled which says Logout should say Login on her screen. You don't get that option till later in the game. That's why I was looking for a Game Center equivalent on android. You don't get that option till later in the game. Not quite sure what you mean by "later in the game"
Let me just walk you through how to log in on Android. Click on the DV app. The loading screen will come up. Hit the ENTER button and it loads into a "local" park. This is probably a level 1 park. If so, the wizard pops up and says "Welcome to DragonVale!, blah, blah blah. Go to the Market and Buy a Plant Dragon." Now she should have the Options button down on the lower right hand side of the screen like in the screen shot above. When she clicks on the Login button, another message will pop up saying "Use Facebook or Local Park?" Chose the Facebook option and loading screen will return. Hit Enter again and she should be back in her old park. That's why I was looking for a Game Center equivalent on android. There is no game center equivalent on Android. Actually, that's no longer true, but it doesn't matter for our purposes because DragonVale doesn't really use the Games Center equivalent yet. Well, she didn't have a login button. That would have been obvious, I'd think. Anyway, I won't see her again till Monday, but I'll see if they got it working tomorrow. I have participated in the last call competition of the qtrly dragon. It just occurs to me, after reading this tread that how to pay up? I play DV on the iPhone so it is easy to request friends that play on the same platform. How do I know which OS "abc" is playing on? As for paying gems, you simply friend the winner(s) and give them a gem a day until you are paid up. Then announce you have paid in the thread. This was done because of the problems sending gems across platforms. And iOS is the major party. I have had a lot of crashing during collections. Going slower didn't much help. I have also had a lot of problems with it not taking when trying to set a dragon to compete in the Coliseum. I'd try a dozen times, and the Coliseum would still be empty. Finally, after a couple of very frustrating weeks I wrote to BF support. The CSR wrote back that it must be my fault -- I must be clicking on the Filter button by accident. Yeah, that response really lowered my frustration level. I finally found that if I did a full reset of my iPhone the problem complete vanished. Perhaps a power cycle would work as well -- I don't know. I also have been having a lot of problems with crashing since the new update. I highly recommend to anyone who is also experiencing problems like this after an update is to Redownload, Reboot, and Relaunch DV to clean up any "useless" data that could've been collected in the latest update. When collecting and my game just suddenly freezes, I stop tapping everything, zoom up on an animated object, and wait for a few moments in the game (about 30 seconds) to watch its effects to see if it is running smoothly or not. Usually by then, the server would relay all of my collected data back to my side of the game and I can continue to play normally again. It can be quite tedious at some times, however, this strange method seems to work for me. The only major problem that I am having is gaining access to my Social menu. I can't collect gems and can barely skim out enough time to send gems to those who are on the alphabetical "top" part of my list. However, have no fear (or maybe a little ), because BFS is going to release their newest update 1.17.1 in the near future that is said to have fixed this problem for collecting the incomes in DragonVale. It is out for Android users on Google Play, however, Amazon and iOS players still have yet to receive it. On an iPhone, how do I post a picture? The pic is currently on my phone, under Photos. Much thanks. You need to move the photo to a internet hosting site, such as dropbox or photobucket. Then, when you post on the forum, you can include the image link in between two IMG tags, and the forum renders the image. There are other ways too, but this is one of the easier ways. Thanks again. Will try this weekend. Dont know if anyone notice a glitch on the upgraded gemstone island? Hope to see more pics in the best island/park contest. Notice the shadows hovering atop each dragon? I think it's a side effect of the shadow moving in 2d, along the 'ground' while the dragons fly in 3d, which in the case of the gem island, also includes over and below thin air. So the shadows are where they would be if there was ground, if that makes sense?